Once upon a time, there was a sad, blank wall behind our sofa. The only thing on it was a wimpy, off-center sconce. It was dying for some love and attention - something to give it some oomph and purpose. You've seen some of the story here, and here, but I think today's the day for the full story behind the wall :). I've always admired Young House Love's epic gallery wall of white frames, but didn't want to spend my pennies on a bunch of frames at this point - even inexpensive IKEA ones. 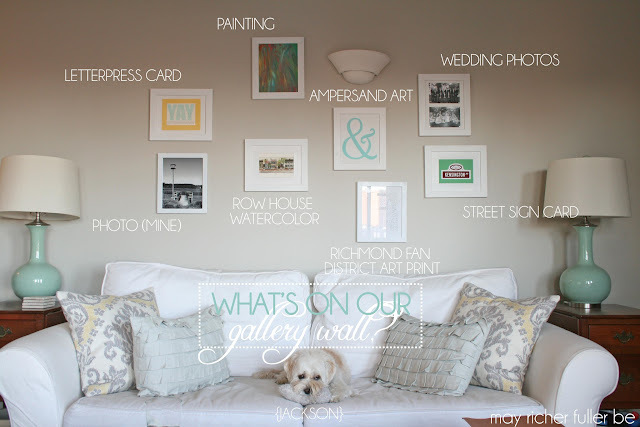 So I waited, and I pondered how I could create my own gallery wall on the very cheap. All the while, this wall remained a blank slate. It bugged me to no end. Then something magical happened. One day, waaay back in the fall (end of October, I think? ), I was walking out of our apartment building's garage, and saw a stack of six empty wooden frames. Though they were pretty beat up, or as I like to say, "rustic," I saw plenty of potential, and I couldn't turn down six identical free frames (free being the key word). The perfect find to start building a gallery wall. Looking much better than before, but it wasn't nearly as full-looking as I wanted it to be. 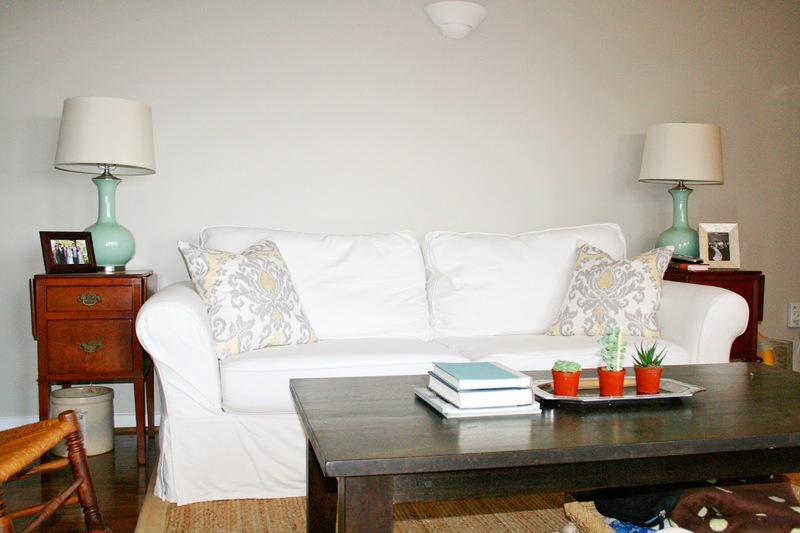 If you read this post, you'll remember that I also had a few similarly sized black frames on hand that I painted white and added to the wall to "fill it out." Much better, right? I lived with this for awhile, but something always bothered me about it. See how the six "found" frames are off-white and blend in with the wall and the two newly-painted white frames really pop? I knew I needed to paint those off-white frames white to really make the gallery wall work. So I finally bit the bullet and took them all down and painted them this weekend. Here's the wall in its current state - much more cohesive and pretty! The fact that all the frames are white unites otherwise mismatched art and photos. Starting at the top, you see a painting that looks like a five-year old may have done it. But ohh no, that was all me. Don't envy my painting skills, k? I know it's ah-mazing. (That was sarcasm, in case you missed it. I know it's not exactly a Monet-equivalent.) I needed some art therapy the other night, so I may or may not have thrown some paint on one of the canvases and used my fingers (yep) to create this piece of "art." 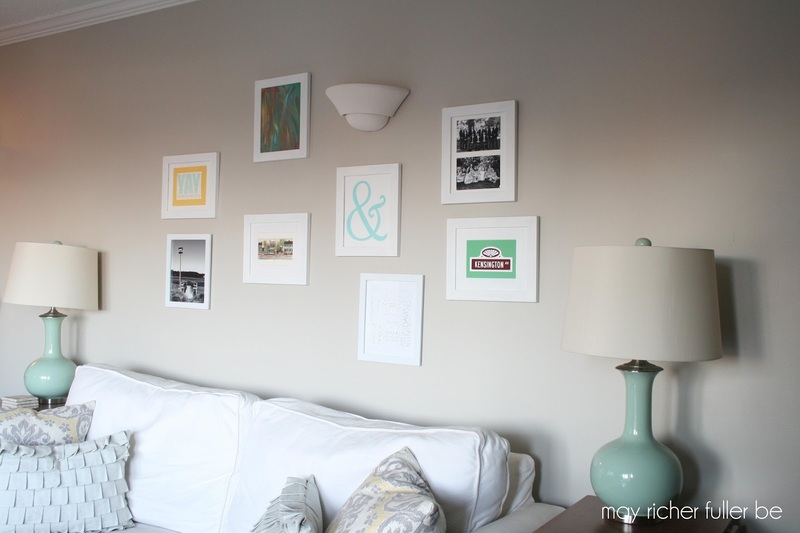 It may or may not stay, but that's the beauty of a gallery wall - you can pop art in and out on a whim! Let's continue clockwise around the wall with the ampersand art. I also did that one. You can read about how here. 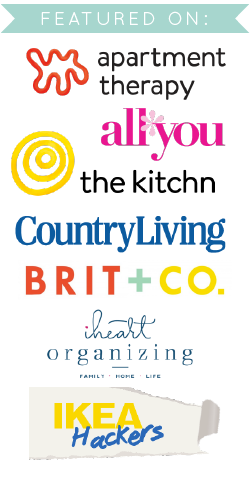 It's an ode to my love of typography. The street sign card is a little thing I picked up at a local Richmond shop as a reminder of our time spent living on Kensington Ave. The Richmond Fan District art print is one that should look familiar. You may have seen it on my sidebar or remember my post about it. I designed it and it's for sale in my Etsy shop if you'd like one. Continuing on around...with the row house watercolor. It's of some houses on the street my parents lived on when I was first born. I spent the first six months of my life in a cute little row house. Wish I remembered that! I love row houses and would love to live in one someday. The photo is one I took on a trip to the beach in South Carolina a few years back. I love the simplicity of the birdhouse overlooking the dock and lagoon. So peaceful. And lastly, the "YAY" letterpress card was part of a gift from C. It's just so fun, I couldn't resist putting it up. That'll do it! 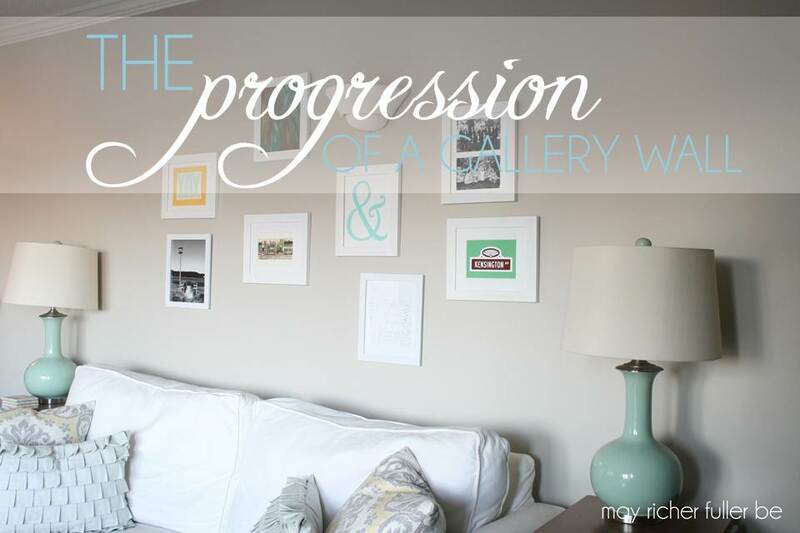 That's story of the progression of our gallery wall. I love that all of the art and photos are meaningful, and the fact this project ended up being extremely budget-friendly. Just goes to show you don't always have to shell out a large chunk of change to decorate your walls. Let's take one last look at how this wall has developed. What do you have on your walls? Any fun stories behind any art or photos? Thanks Kayla! 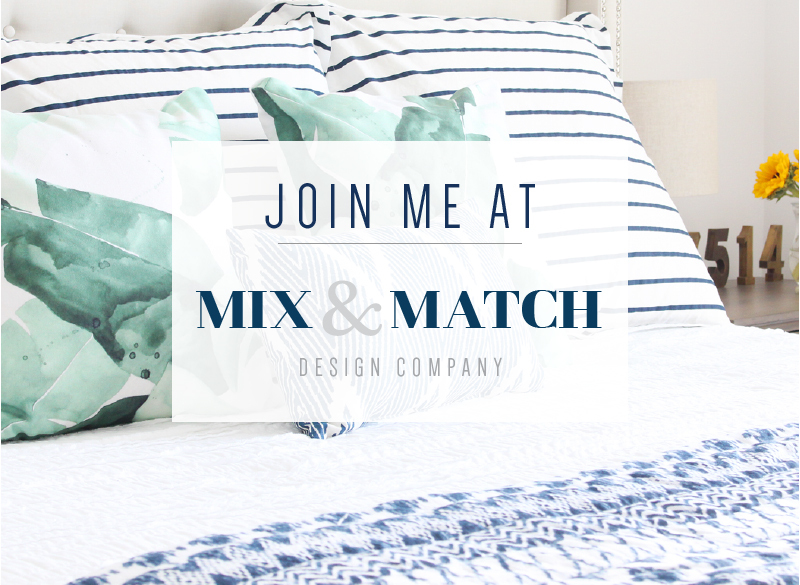 And thanks for the invitation to link up - I'd love to! 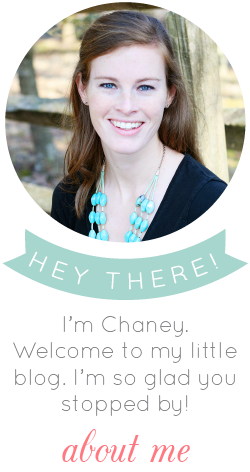 Chaney, this looks great!!! I love the ampersand art! It just pops! Hope you have a great week!